Award winning knife designer ken onion has designed this gorgeous and functional rain series of knives. This collection combines high-quality materials, a unique blade pattern and a distinctive handle, resulting in a series of knives that are both visually stunning and offer superior function and ergonomics. Constructed of high performance stainless steel, the unique blades have been treated by a proprietary process that creates a beautiful rain pattern in the knife blade. This pattern acts as both a design feature and a function. 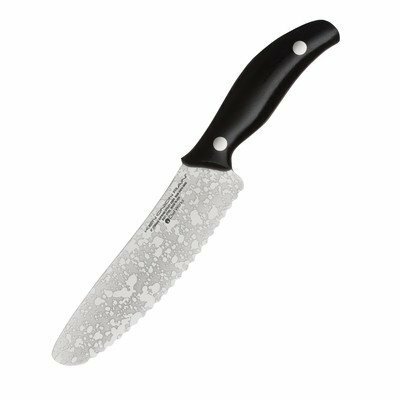 The raised pattern reduces drag and surface tension across the blade which helps in cutting and having food stick to the surface of the knife. The handles are designed to be the most comfortable and ergonomic, putting your hand into the most efficient position for cutting. The handles are constructed of g-10 material. This is an incredibly strong, military grade material that is highly impervious to both heat and moisture. There are 14 knives in this collection.